Several hundred protesters have gathered in the German city of Dresden to protest against Chancellor Angela Merkel and President Joachim Gauck as they celebrate Unity Day in the city. One sign referred to Merkel's "dictatorship." 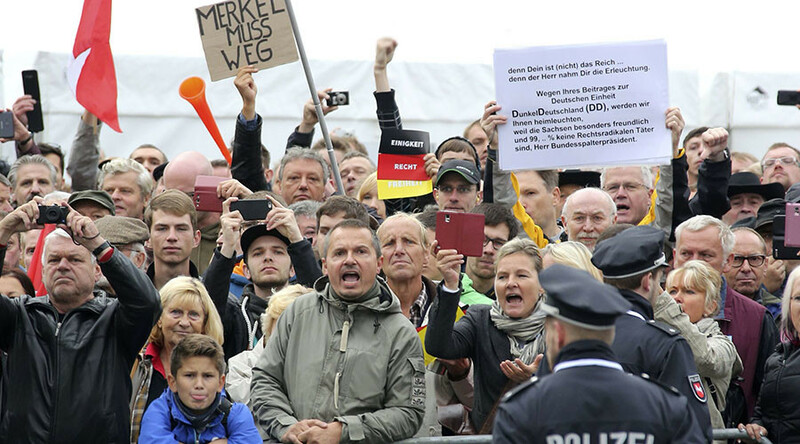 Many of the protesters are from the far-right Patriotic Europeans Against the Islamization of the West, better known as the PEGIDA Alliance, Germany's N-TV reported. Dresden is PEGIDA's birthplace. A total of 11 demonstrations are planned throughout the city on Monday. The discontent aimed at Merkel comes as little surprise, with the chancellor's approval ratings hovering at a five-year low. A major point of contention among many Germans is Merkel’s open-door policy for refugees fleeing war and persecution. More than 1 million asylum seekers reached the country last year, as part of the biggest refugee crisis since World War II. The area surrounding Dresden has seen far-right violence against migrants and refugees since the influx began, with riots and arson attacks taking place in other towns in the state of Saxony – of which Dresden is the capital. Security has been tightened for the three days of events marking 26 years since German reunification, specifically after unknown perpetrators set fire to three police cars in Dresden on Saturday night.